view-only access to docs from mobile devices. This has come in handy for me because I use Google Docs spreadsheets to keep track of a lot of nerdy and not-so-nerdy things in my life. I've often found myself wanting to access my spreadsheet data on the go, when I'm not near a computer. Today, I'm happy to announce that we've made mobile access even better by adding new capabilities with List View for spreadsheets. 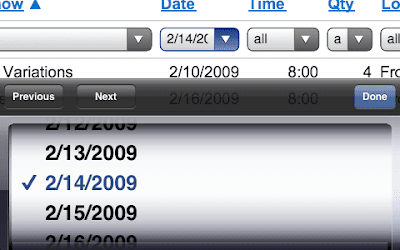 You can quickly view, edit, sort, and filter your spreadsheets on a variety of mobile devices including Android-powered devices like the T-Mobile G1, the iPhone and iPod touch, and the Nokia S60. 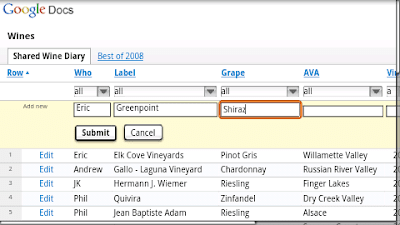 With Valentine's Day coming soon, I'd like to share two ways that List View is helping me to play cupid. 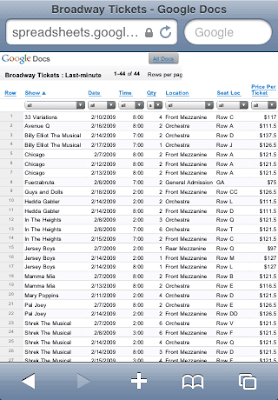 Mobile List View showing all shows (sorted by "Show" column). Shown in portrait mode on the iPhone. Choosing a filter for the "Date" column. I could see only the rows that matched my filter, and I eventually found a show that I knew that my boyfriend would like: "Billy Elliot The Musical" at 7pm with orchestra seats. All rows matching the "2/14/2009" filter. With tickets purchased, and a restaurant booked, I'm nearly set. Here's another example of how this enhanced mobile access will come in handy tomorrow night. A few of my friends and I like to think of ourselves as wine aficionados. We rate wines that we like (and don't like) in a wine diary and it's kept in a shared spreadsheet. On the T-Mobile G1 or the iPhone home screens, we all have shortcuts which link directly to the spreadsheet. 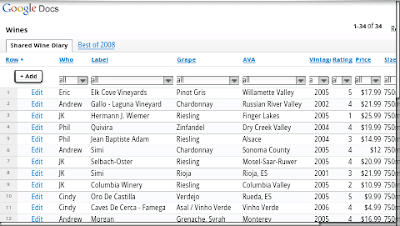 Mobile List View showing all wines. Landscape mode on the G1. Mobile List View "Add row" widget on the G1. Tomorrow night, mobile access to this spreadsheet will come in handy when presented with a big wine list, with my significant other looking at me across the table waiting for me to pick a wine (already). Try this out by pointing your mobile device's browser to m.google.com/docs. And if you use Google Apps, go to docs.google.com/a/your-domain. This feature is available in all 38 languages that are supported in Google Docs spreadsheets. Over a year ago, we enabled view-only access to docs from mobile devices. This has come in handy for me because I use Google Docs spreadsheets to keep track of a lot of nerdy and not-so-nerdy things in my life. I've often found myself wanting to access my spreadsheet data on the go, when I'm not near a computer.